One of the most pervasive myths about the United States is that the federal government has never defaulted on its debts. 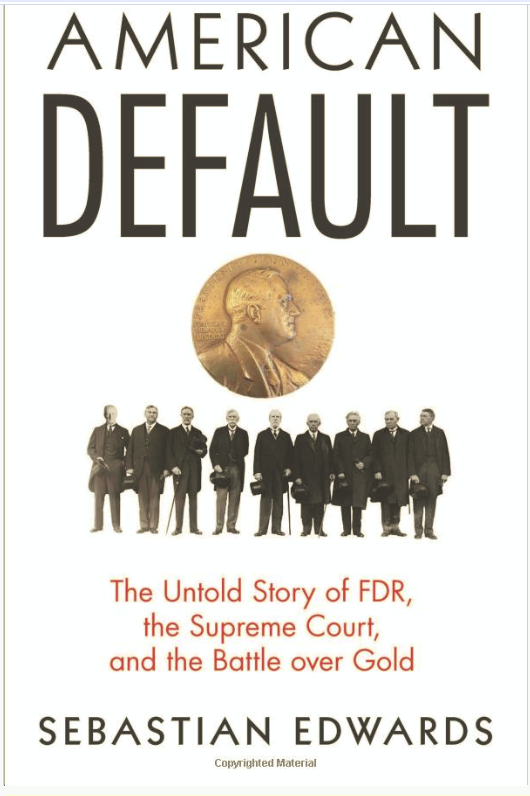 Sebastian has also published an excellent synopsis of the the book, Learning from America’s Forgotten Default, on the Project Syndicate (PS) website. It is an excellent introduction to the subject material but only scratches the surface and should not be a substitute or excuse for not purchasing the book. On January 30, 1934, the dollar was officially devalued. The price of gold went from $20.67 an ounce – a price in effect since 1834 – to $35 an ounce. …those holding securities protected by the gold clause claimed that the abrogation was unconstitutional. 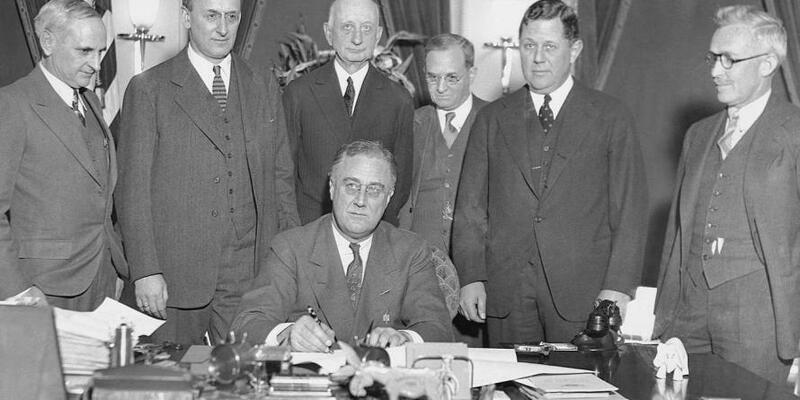 Lawsuits were filed, and four of them eventually reached the Supreme Court; in January 1935, justices heard two cases that referred to private debts, and two concerning government obligations. On February 18, 1935, the Supreme Court announced its decisions. In each case, justices ruled 5-4 in favor of the government – and against investors seeking compensation. …the 1935 ruling is invoked [today] when attorneys are defending countries in default (like Venezuela). And, as more governments face down new debt-related dangers – such as unfunded liabilities associated with pension and health-care obligations – we may see the argument surface even more frequently. …the US government’s unfunded liabilities are a staggering 260% of GDP – and that does not include conventional federal debt and unfunded state and local government liabilities. The good professor lays it all out, which may or may not be the roadmap for how the U.S. and other highly indebted governments resolve their ,massive and almost impossible to fulfill contractual obligations to both creditors and its citizens. The Supremes have already ruled in favor of the government under the “necessity” argument. Sebastian’s material gives us much ammunition in arguing with the Modern Monetary Theory crowd, who believe a sovereign government cannot and will never default on its local currency obligations if it has an independent central bank. Of course, they will argue that FDR and the U.S. didn’t have an independent monetary policy because of its link to the gold standard. It seems to us the MMT crowd believe that because a government has an independent central bank and can always print money to payoff debt, they will never, ever experience rollover risk. Complete nonsense. When a government experiences financing problems through a sudden stop in funding, the leaders must make a political decision on whom to inflict the pain. Either default, which hurts their creditors, and who may be predominantly made up of foreigners, as was the case in Russia in 1998; and is the case with the U.S. federal government marketable debt in 2018; or monetizing the rollover, resulting in hyperinflation and wiping out domestic residents. We suspect when the day of reckoning comes for the United States to pay for its debt profligacy, it won’t be such a simple binary choice. There will be many and various types of public sector obligations in the queue to be paid, which may require differential treatment. Sebastian’s example of the U.S. government default in the 1930’s is a combination of both. The default on the contractual gold clause and the inflating away of much of the debt through devaluation. This is tantamount to an emerging market government unilaterally and retroactively converting its foreign currency debt into local currency and then monetizing it, and supported by the legal system. How would that work out for, say, Venezuela dollar denominated bond holders? Let’s hope our political leaders and policy makers come to their senses before that dreadful day is upon us. Now take the few minutes to read the full article and go buy the book for some excellent beach reading. .